The BEST Easter Mud Cake Hack! We all love a good Mud Cake Hack right? 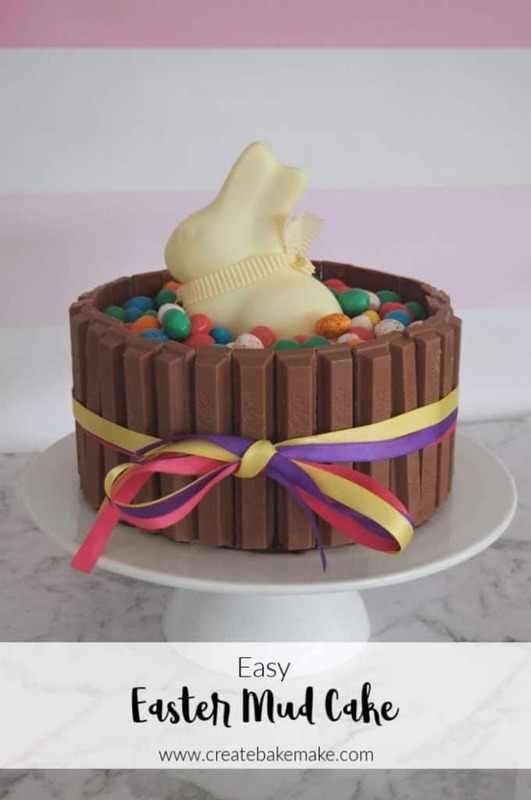 I’ve put together this chocolate packed Easter Mud Cake Hack for less than $40, making it a great budget Easter Celebration Cake. Without meaning to brag, I think this cake looks FABULOUS without requiring much effort at all (yes, even I like to have some time off from baking too!) to put together – which is an added bonus over Easter when you are wanting to spend time with your loved ones. 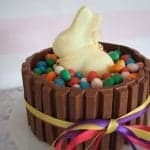 This gorgeous Easter Egg Cake is made using a classic Woolworths Chocolate Mud Cake plus a variety of yummy chocolates. 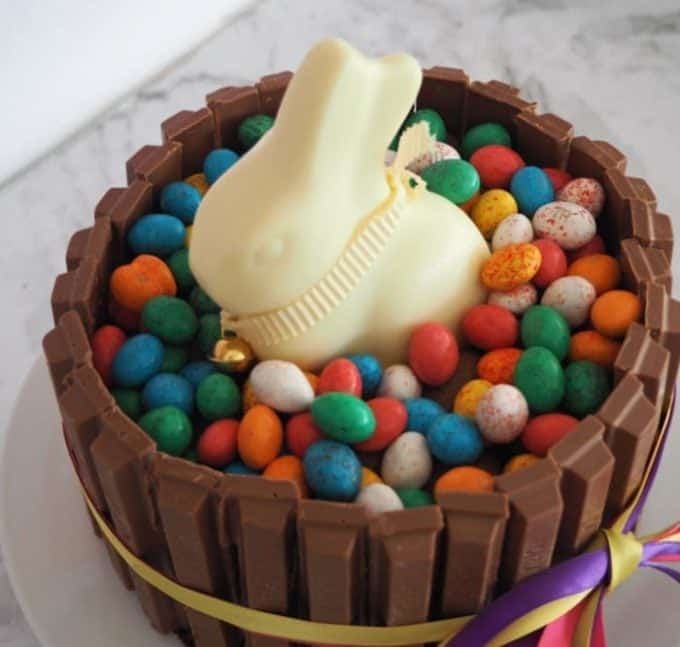 You can use your favourite easter eggs for this cake, and my kids were very eager for me to use the Woolworths Popping Candy Easter Eggs, or exploding eggs as they call them! Once you’ve picked up everything you need from your local Woolworths, you can then put this cake together in less than half an hour – yep seriously! I think the trickiest part is sticking the KitKat pieces to the side of the cake. Please don’t worry about them moving too much, as you also use the ribbon to secure them. Break your KitKat Chocolate block into pieces and remove the wrappers from your Easter Eggs BEFORE you start putting your cake together as it makes decorating your cake easier. Feel free to use your favourite chocolate eggs and bunny for this recipe. We also LOVE Caramel Filled Eggs. Along with helping to make your Easter Mud Cake look pretty, the ribbon also helps to keep the KitKat pieces in place. You will only need one tub of pre-made chocolate frosting for this recipe. If you are looking for some more great Mud Cake ideas, make sure you check out this post from Lifestyle.com.au where I also share five of my favourite Kids Mud Cake Hacks. This is the BEST and EASIEST Mud Cake Hack going around! This Easter Cake takes less than 30 minutes to prepare and will impress your family and friends. Place the mud cake onto your serving plate. Break the KitKat Chocolate Blocks into sticks and unwrap your Easter Eggs and set aside until needed. Apply a thin layer of chocolate frosting around the side of your Mud Cake and then stick the KitKat sticks around the outside of the cake. Secure with the ribbon once the outside of the cake is covered in KitKat pieces. Place the remaining frosting on top of the mud cake and gently smooth. 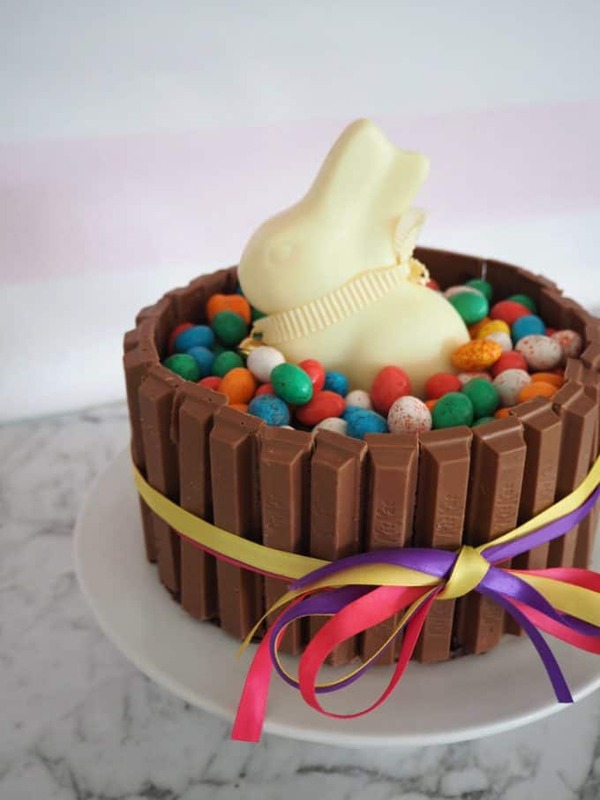 Add the milk chocolate and popping candy Easter eggs to the top of the cake, leaving a small space in the middle where the White Chocolate Bunny will go. Place the White Chocolate Bunny into the middle of the cake before sprinkling the speckled eggs around it. « The BEST Easter Recipes!